The start of the Carolina Hurricanes 2014-2015 preseason has already seen its first causality. 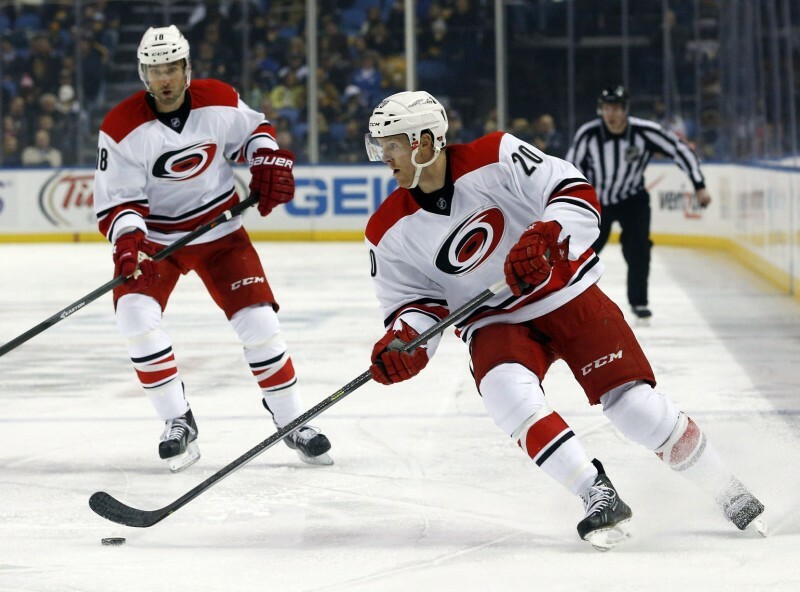 Jordan Staal broke his leg in his first action of the preseason. He collided with Josh Gorges of the Sabres and left the ice immediately. There is no timetable for his return, and the team will evaluate the injury when they return to Raleigh. Jordan Staal has been a hot topic of conversation this offseason. The veteran center was poised to play a big role in the team’s success in the upcoming season. This is Staal’s first injury as a Hurricane. The team will now have to plan around not having their second line center for what will be an extended amount of time. The Hurricanes had a quiet off-season and didn’t make any big signings that could step up in his absence. They will now have to rely on the younger players that will be battling out to replace the huge amount of minutes from Staal. This doesn’t mean the end for the Hurricanes, and if Staal does return this season, his return to the lineup could be a huge boost for the team during the season. The Hurricanes have young players who can step up and take advantage of the extra minutes. Former first round pick Elias Lindholm was a player I talked about having a break out season earlier in the off-season. He can play center, and I expect him to step up and take the extra minutes the Jordan Staal injury will offer him. It will boost Lindholm into the spotlight a little more but he will be able to handle it. Riley Nash is another player that can step up and play the extra minutes to try to help make up for the missing Staal brother. Nash played well in the first preseason game of the season scoring a goal against Columbus. It is a big opportunity for him to fit himself into the top six and grow as an NHL player. Jeff Skinner can also play a little center on the second line, but I would rather see him stay on Eric Staal’s line and build on the chemistry they made last season. Victor Rask really showed up at the NHL Prospect Tournament in Traverse City this year. He scored a game winner in the tournament against the Rangers prospects and has been a bright spot for the Canes early this preseason/training camp. In the same game that Jordan Staal went down, Rask played 17-plus minutes and went 11-for-16 in the faceoff circle. In this terrible situation with a great player getting injured, it would be a perfect time for Rask to break out. Even if Rask doesn’t break into the top six of the lineup, he could end up being a solid depth player for the team Staal’s absence. It is always terrible to see a great player like Jordan Staal to go down with a serious injury. I wish Staal a quick and successful recovery, and can’t wait to see him back on the ice. The injury doesn’t mean the end of the season for the Hurricanes. It is a perfect time for younger players to step up and sure up the depth down the middle of the lineup for the Hurricanes. Victor Rask is a prime candidate to have a break out season, and other main stays in the lineup will take advantage of the opportunity to play big minutes. It is also a perfect time for players to start to replace the leadership that Jordan Staal brings. They will need more of their veteran players to come in and add leadership on and off the ice.